Sometimes, I imagine what life would be like if I had no problems. If my kids were perfect little angels. If I had a perfect marriage. If all of my clients were compliant, easy to deal with and were happy to pay me a lot more money. If cars and houses didn’t need expensive maintenance. If I was in peak physical condition (with minimal effort of course). 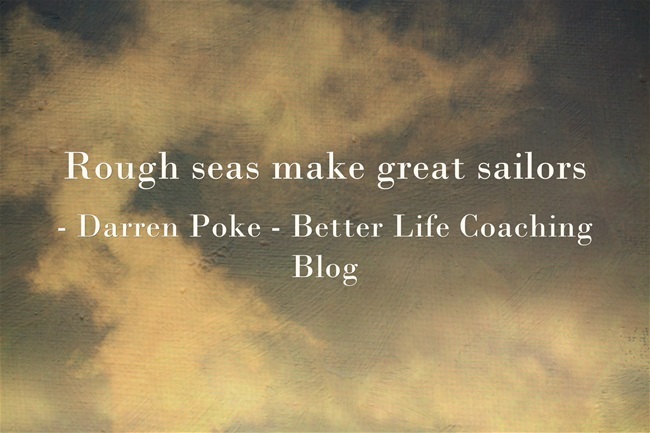 Because rough seas make great sailors. I become a better father and husband when I learn to deal with the challenges of family life. My business gets better when I successfully handle challenging clients. I learn more about how to look after myself when I get older and my body starts to creak a bit. I want to become a better person and I want to become a more effective influence in the world. And that won’t happen if life is just smooth sailing. So the next time you are presented with a challenging life situation, don’t pray for calmer waters, pray that you become a better sailor. And in doing so, you will be getting prepared for bigger and better things in the future.